March is Women's History Month, which can trace its roots to March 8, 1857 – when women from New York City factories staged a protest over working conditions. International Women's Day was first observed in 1909, but it wasn't until 1981 that Congress established National Women's History Week to be commemorated the second week of March. In 1987, Congress expanded the week to a month. Diversity Table Contests are held in February, March, May, June, September and November. WINNERS RECEIVE $150! Want to submit your snapshot? Please send a vertical (portrait) photo – similar to the one featured above – that’s well-lit, in focus and has an uncluttered background. The photo should be a JPEG file. You can submit several photos for consideration. Include your name, company name and city. Be sure to put Diversity Chef Table Snapshot in the subject line. You've probably never had meatballs like these before. A second helping is not out of the question, so dig in. If you're ready to expand your entrée options, here's your chance. Add this combination of tender beef and tangy slaw to your recipe roster. Serve this fabulous entrée with Mexican red rice, plantains or a vegetable medley. Austin Grill Express brings authentic Tex-Mex flavor to you! Contact Chef Rommel Mendoza for additional recipe information. Pair vegetables with linguine for a simple meal that's absolutely fabulous. You can substitute cremini mushrooms and edamame for the morels and fava beans. Can't bear another heavy meal? This one won't weigh you down. Nor will it require tons of time in the kitchen. Menu items marked as FIT meet certain criteria, which were developed to be consistent with current dietary recommendations. Connect with diners by providing our exclusive reading material at your location. 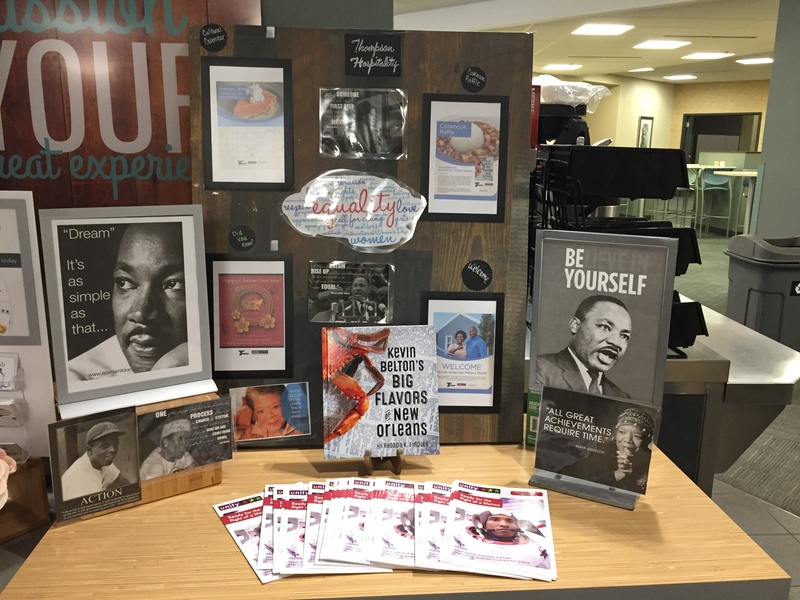 Each month, Our Cultural Calendar, Did You Know and Entry signs are filled with fresh, engaging information for your customers to enjoy. For directors and others making presentations to clients, the PowerPoint slides provide a quick snapshot of our diversity content. Add a little excitement by posting our monthly Cookbook Raffle sign at your location. NOTE: Books for the raffle should be purchased only from Barnes & Noble. Café Thompson is new culinary offering that will improve Thompson Hospitality's onsite presence. With the number of product and corporate brands that are featured in our daily operations, it's easy for the Thompson Hospitality brand to get lost. Café Thompson is a marketing tool that will help solve this challenge. Café Thompson is a live cooking exhibition and is presented as an action station. All recipes come from the Thompson Hospitality recipe library. You can bookmark the Joint Ventures page and find the recipes there, and they are delivered via the monthly e-blast. Use this program at a minimum of once per month, or you can use it biweekly or weekly. You can find the materials you will need to market this program here. Download the posters and signs that will work best for your operation. Depending on the café station location and space, use a full size poster, an 11" x 17" sign or a regular letter-size sign. Recipes are displayed in a counter-top sign holder or on the poster as seen in the illustration to the left. Display your marketing materials early (when employees first arrive to open and prep) on the day of the event. Also, the chef or employee working the action station must wear a black bib apron branded with the new Café Thompson logo, complemented by a black skull cap. Contact Mike Taylor at (908) 644-7987 or mtaylor@thompsonhospitality.com with questions about the program or ordering information for branded aprons and skull caps. These documents come in handy when you need to promote an upcoming appearance by one of our chefs at your location. 20" by 30" when finished. Send to inhouse print shop or print on a color desktop printer. These files print on standard letter-size paper. As part of our joint venture with Compass Group USA, Thompson Hospitality produces a full-color, eight-page publication six times a year. It's perfect reading material for diners to pick up at your location or enjoy via the Web, tablet or smartphone. Unity is a cultural publication from Compass Group and Thompson Hospitality. Approximately 25,000 are distributed in Fortune 500 environments (IBM, Microsoft, Bank of America, Boeing, etc. ), K-12 schools systems (Chicago Public Schools), colleges and universities (HBCUs), museums (Smithsonian's National Museum of the American Indian), and other influential venues in coordination with the official heritage months celebrated throughout the year. Stories are positive, inspiring, and focus on food, art and culture. Read President and Chairman Warren Thompson's message to all employees. And get up-to-date info on current initiatives, new accounts and much more. Café and cafeteria managers can make use of our Chef Spotlight Menu Templates (pre-visit) and Evaluation Reports (post-visit). And if you're in need of a vendor, check out our MWBE Suppliers List. Our Promotional Table Setup document is a visual guide for setting up our marketing materials at client sites. Pictured is a guide for displaying Unity and Chef Spotlight material. Letter-size documents can be sent to an in-house print shop or printed on a desktop color printer. You can purchase acrylic sign holders for these documents online or at brick-and-mortar office supply stores. Have the 20x30 posters professionally printed, foam-board mounted and laminated. Each month’s Cookbook for Raffle can be purchased online or at major brick-and-mortar booksellers.